Thank you for all your sympathy in taking out the stretch stitches. I’m just happy I’m not sewing this knit on my serger! Thank goodness I am a political nerd. I turned on the US Presdidential debates and sat down with my seam ripper. A cramped hand and a final debate later the dress was taken apart. 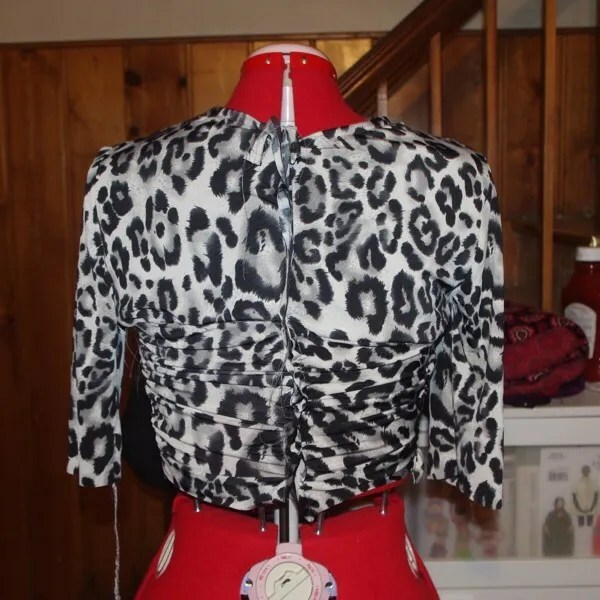 Here’s a quick post on how I took the width out of the front bodice and back bodice pieces for my Tracy Reese ruched dress. I saw that Amanda took 1.5 inches from the front. When I pulled my bodice front that much, it still wasn’t ruching. So I took three inches out the front by folding out 1.5 inches along the ‘fold’ line of the pattern (piece 7) which is center front. 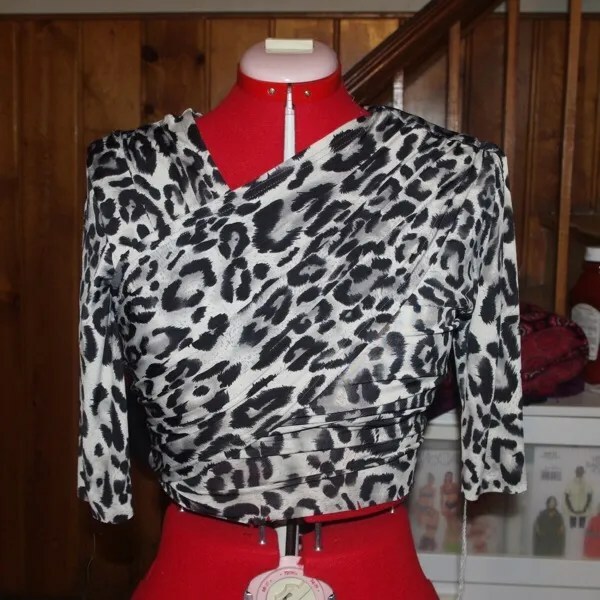 For the front drape, I shortened it by one inch — mostly toward the bottom / skirt portion. Probably a hair too much. But, it looked pretty good when I tried it on. You’ll see now on the dressfrom that the bodice is still not super ruchy, but, it doesn’t hang down at center front any more. I think I’ll finish up in the next week. There is quite a bit more lining to install plus a FOUR piece skirt to construct. I don’t think I’ve ever had two mid-construction posts on non-black tie dresses — nevermind a knit. Heh. Oh, I need a zipper too. I hope Joann’s carries nice bold metal zippers. I ordered my last one online for my purple friday dress and the shipping was high but the zippers were gorgeous. Wow that makes a huge difference, I thought it looked pretty good before, now it looks fantastic. Oh, this is really looking good! Totally worth taking the time to make the changes. It’s looking good. 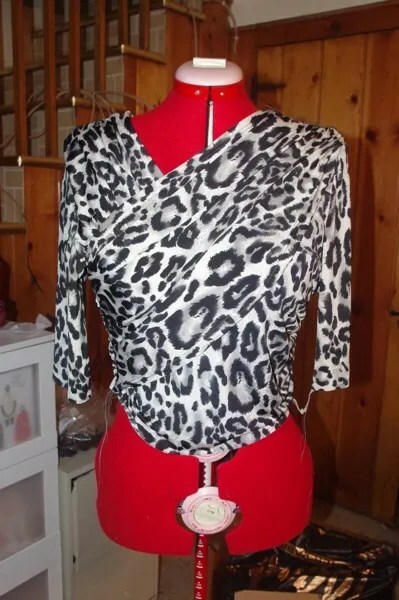 I think that this is going to look fabulous on you. BTW I never use the stretch stitch on my machine; it’s too hard to rip. I just use a narrow zig zag. I’ve never had a problem. If I want a fake safety, I use that stitch and serge next to it. I totally love the leopard. It’s in my favorite black and white and it’s animal print. I know you aren’t in love with it, but there is no way that this dress could look old lady! Well its looking good to me :O). I can’t wait to see the total finish. That fabric is fantastic! 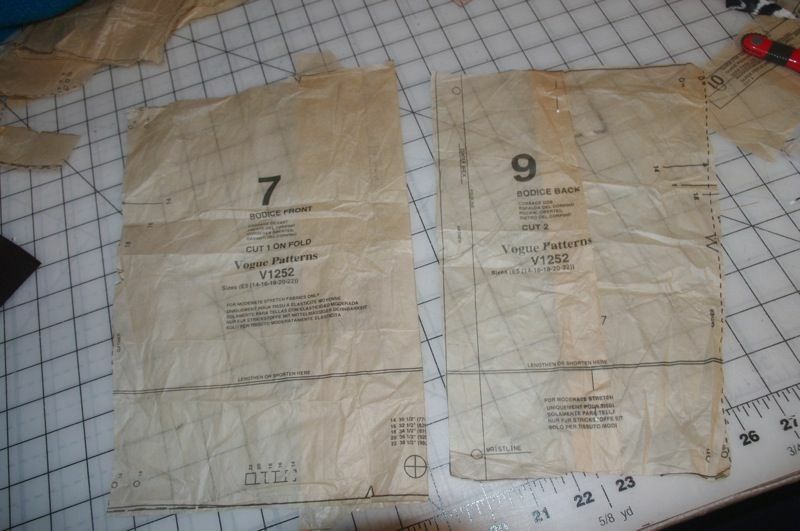 I actually starting cutting out a garment today! Shocking I know. Love the dress, love the print, it is going to look fabulous. Of course, I am partial to animal prints. The fabric is beautiful! The dress suits you a lot as well. Well done! The bustier looks lovely! If it’s wore under a jacket it could like quite cool as well. Well done! Very well made and look at the matching checks! Well done! To solve the shoes / commuting problems I have a pair (sometimes 2 pairs ) of heels in the office which I will change to. I have a 15 mins walk from station to office so between home and office you will see me in flats… I try to make an effort with the photos though, i mean not only the photos with me in but also the progress photos. A good picture is worth a thousand words…and I totally agree with you about the lack of daylight in winter times! Just stopped by to tell you to stay safe. Got your hatches battened down? The bodice is looking great now. I think it will turn out to be worth the effort.